© Newtown Grafitti, Reproduced under CC Licensing. - AUD falls after RBA forecasts see market's bet firmly on rate cut. - But fresh losses incoming Monday as CNY reacts to trade war news. - As latest rhetoric suggests a U.S.-China deal is a long way from done. The Aussie Dollar will remain on its back foot next week because concerns about interest rate policy are about to be supplemented by fresh China-related losses that gatecrash 2019's party in the Antipodes on Monday, analysts say. Australia's Dollar weakened broadly Friday after the Reserve Bank of Australia (RBA) took an axe to its economic forecasts and warned of increasing downside risks to the outlook, just as markets are beginning to doubt that the U.S. and China can reach a deal to end their so-called trade war before March 01. The RBA said in its statement on monetary policy Friday it now expects the economy to grow by just 2.75% in 2019, down from the 3.25% forecast issued at the end of last year. And core inflation is set to rise only to 2% this year, rather than the 2.25% the RBA previously envisaged. Slower global growth and weaker household spending are the main factors behind the forecast downgrades, although some economists say the RBA is still being too optimisitic in its outlook for the domestic economy because falling house prices could have a larger than anticipated impact on household spending. House prices are falling steadily in Australia's main cities and many economists now fear a "hard landing" for the real estate market. RBA forecast downgrades come just days after Governor Philip Lowe shifted the bank's interest rate stance by abandoning earlier guidance that suggested the next move in rates would be upward. He now says the risks of a hike are finely balanced with the risk of a cut being delivered over coming years, prompting markets to bet heavily the RBA will reduce interest rates before February 2020. "UBS see GDP slowing to a below 'trend' pace of 2.3% y/y in 2019, and hence a likelihood of a softening (rather than tightening) of the labour market over the next year, and hence little inflation pressure, we now look for a 25bp cut in Nov-19, and an additional 25bp cut in 1H-2020," UBS' Tharenou says. The AUD/USD rate was quoted -0.23% lower at 0.7077 during the morning session Friday but is up 0.37% for the 2019 year-to-date. It had previously been among the best performing currencies of 2019. 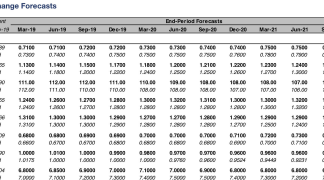 "We don’t see too much further AUD downside, with an RBA rate cut 100% priced for February 2020. There is however a lack of catalysts on the horizon to lift AUD/USD," says Richard Grace, head of currency strategy at Commonwealth Bank of Australia. 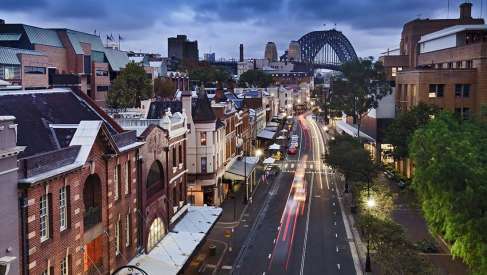 The Pound-to-Australian-Dollar rate was quoted 0.10% higher at 1.8270 and is up 0.96% for 2019. Sterling holds second place in the 2019 G10 league table. "We were stopped out of our short GBP/AUD yesterday for a 1% loss and will steer clear of both for now," says Elsa Lignos, head of FX strategy at RBC Capital Markets. "The SoMP itself laid the ground for cuts, with growth forecasts shifted lower than suggested by the RBA’s post-meeting statement." "Declining yield and interest rate differentials stand in contrast with its increasing foreign funding needs," warns Hans Redeker, head of FX strategy at Morgan Stanley. "Rate differentials are smaller and Australian asset valuations are increasingly dependent on foreign flows. As a result, AUD may decline faster than previously when risk appetite diminishes." 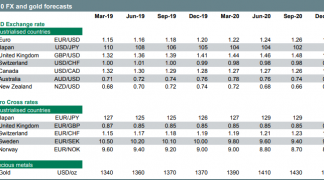 Market pricing has shifted sharply in recent months from implying in a rate hike is likely before 2020, to a rate cut, which has weighed heavily on the Australian Dollar. However, with lower rates priced in, a new catalyst is required for further losses to materialise. But observers may not have to wait very long for that catalyst to come along, because some analysts are growing increasingly concerned about the odds of another escalation in the so-called trade war between the U.S. and China. "Trump is NOT going to meet Xi after all. Surely that is as clear a sign as one could get that there is not going to be a deal done?" says Jane Foley, a strategist at Rabobank. President Donald Trump told reporters Thursday he is not planning to meet Chinese President Xi Jingping before a March 01 deadline that will see tariffs on Chinese exports to the U.S. more than double to 25% if a deal addressing Beijing's "unfair trade practices" isn't done by then. After a weeks-long period where Trump has encouraged markets to be more optimistic about the odds of a deal being reached, the statement was seen as a warning that the talks may not be going quite as well as the White House has previously made out. 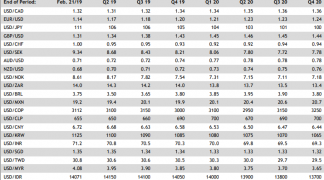 "25% tariffs would be ugly as a more detailed trade breakdown already shows that where they are at that level both import volumes and values are plummeting, while firms are shifting production outside China (i.e., the tariffs are working)," says Rabobank's Foley. Foley says a last minute announcement is likely to come at the end of this month, extending the period that U.S. and Chinese officials have to negotiate a deal for another 90 days, although this projection won't prevent financial markets from panicking in the interim. A 90 day extension may not be enough to soothe markets even after it has been announced, according to Rabobank, because U.S. tariffs are already hurting the Chinese economy and will continue to do it damage after any extension. That means they'll also continue to hurt the Aussie too. "The trade war concerns are once again leading to fears about China, which typically puts pressure on the Australian currency," aays Ulrich Leuchtmann, head of currency strategy at Commerzbank. "It makes sense to expect significant weakness of CNY when the market opens next Monday." Australia's Dollar is substantially underwritten by a strong commodity-based trade relationship with China so it is sensitive to in economic conditions on the ground in China. And China's economy is creaking beneath the weight of White House tariffs. Those are currently just 10% and applied to around $250 bn of China's annual exports to the U.S., although the tariff rate will rise to 25% in March and Trump could target the remaining $267 bn of China's annual exports to the U.S. if a deal is not reached. Commerzbank's Leuchtmann says the Renmimbi has remained stable in recent days only because of the Chinese New Year holiday, which has seen Chinese financial markets closed this week, although he's looking for a sharp adjustment on Monday. That could mean the Aussie also gets hurt early next week.